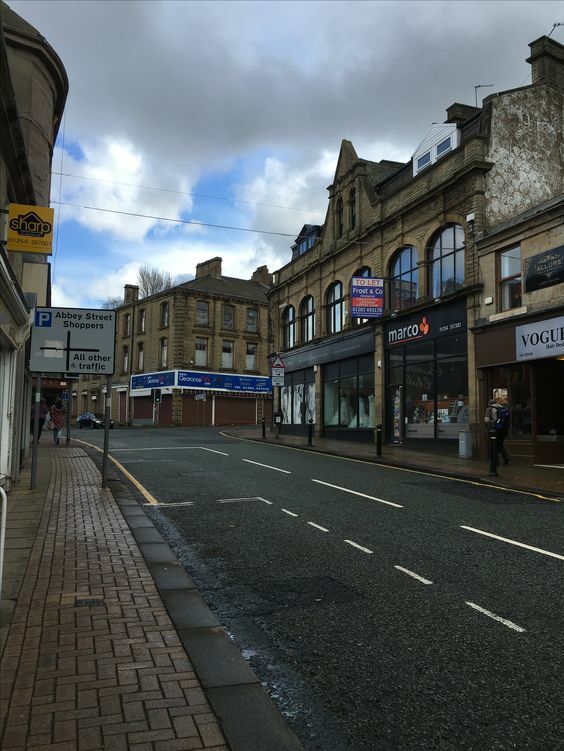 We hadn’t been to Accrington before and I had heard scary stories about the place from a former manager who lived there, so I wasn’t too sure what to expect. The drive from Manchester to Accrington is straightforward - M60, M66, A56 and A680. It takes about 30 minutes from north Manchester. We found free parking behind some shops which is always good. 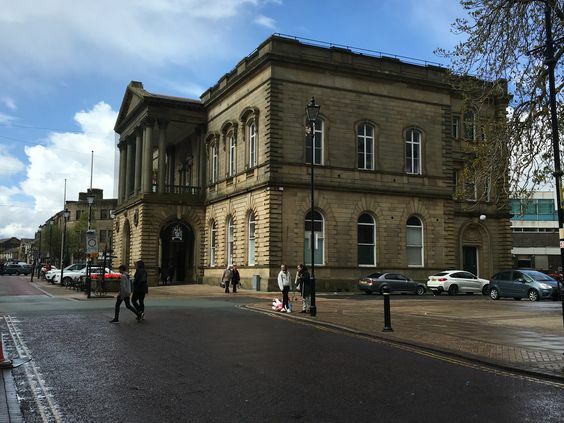 I was surprised to find there is some nice architecture in Accrington – the Town Hall and the Market Hall are fine examples of 19th century architecture with their solid stone facades and symmetrical design. It was great to see the Town Hall was being used to host weddings. There is also a lovely arcade which has seen better days. It has a lovely sweeping curve and light streamed in through the ceiling windows. However the fine stained glass panels, high up on the shop windows are obscured as the shops have installed suspended ceilings so the stained glass colours can’t be seen. This place is crying out for some TLC and some more occupants. 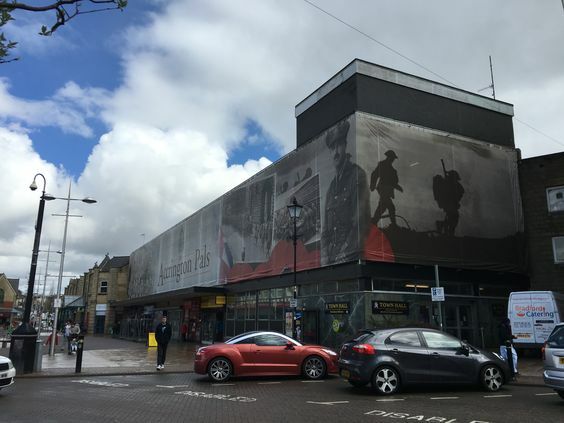 The main shopping area is a 1960s shopping centre, which isn’t very exciting, although I loved the massive banner across the buildings for the Accrington Pals as part of the WW1 commemorations. Across the rest of the town there are lots of independent shops and bizarrely quite a few wedding shops. There are plenty of empty shops too, which is always sad to see. However there seems to be a lively night time economy with plenty of pubs, bars and takeaways – I think this was what my former manager was referring to. Obviously we were here for the charity shops and there are loads. Other people had a similar idea and these shops were busy. Neil experienced a severe case of record section blockers. Most charity shops have their records under the DVDs, so you often find people slowly browse through the DVDs whilst blocking access to the records. Then you find the older blokes who look at every record with no intention of buying anything. Thankfully the larger charity shops were where he had less chance of tripping up old ladies whist he was on the floor looking through the records. For once I got lucky and bought some unused place mats for £1.99. The Market Hall seemed to be a popular place for the older people of Accrington. I think the fact it had lots of benches to sit on was part of the draw. The lady at the pet stall was very helpful with my kitten queries. I like these old Victorian markets as they do give a place a sense of heritage and community. One good reason to visit Accrington is the pun names of the town’s shops. There’s a fish shop called “Passion for Sole” and a cycle shop called “Blood, Sweat and Gears”. 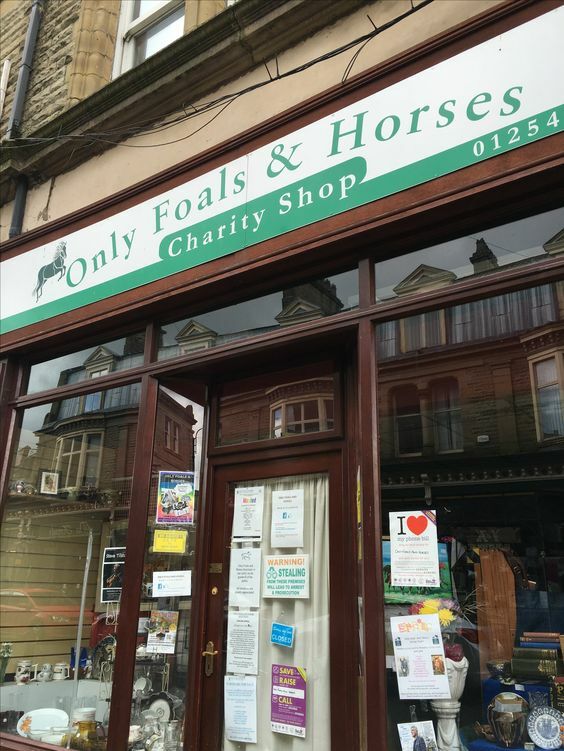 My personal favourite was the charity shop called “Only Foals and Horses” - sadly it wasn’t open but what a fab name! We had a cake and a coffee in Costa. I swear Costa has become the new pub, so it’s quite apt the chain is owned by the brewery chain of Whitbread. It was full of old people catching up with friends and collecting points on their loyalty cards. To be honest I’d rather meet up in a coffee shop with friends rather than a pub these days, but that’s more to do with the fact I do fall asleep after a few drinks. Whilst it wasn’t a very exciting visit, I was pleasantly surprised by the place - the shop name puns alone put smiles on our faces. It’s a down-to-earth working class town, which has seen better days and could do with investment. However it does have a sense of community and that’s always a good thing.